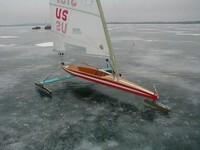 Based on the preliminary ice report it looks like we will be sailing Lake Christina in Ashby on Saturday. Check back Thursday or Friday for an update. Friday looks like a "no-go." Weather Underground predicts winds in Ashby on Friday of over 20 mph by mid-day. The tentative plan is to head up Sat morning. Hopefully, the Doctor will have had time to rebuild the weather mark that US 5432 bulldozed in the second race last weekend. Sorry, Doctor. If you are new to the DN fleet this weekend would be a perfect time to come out and get some pointers. First boats there must check the ice. Never sail alone. Wear ice claws. Think ice.